From the moment my children finally started walking (they were both late walkers) making sure that they had good footwear became important. And whilst the shoes are important it isn’t top priority, for me it is all about ensuring that the measuring and fitting is done correctly. I want to ensure that they are not only wearing the correct sized shoes for them but that the fit on them is suitable for their little feet. 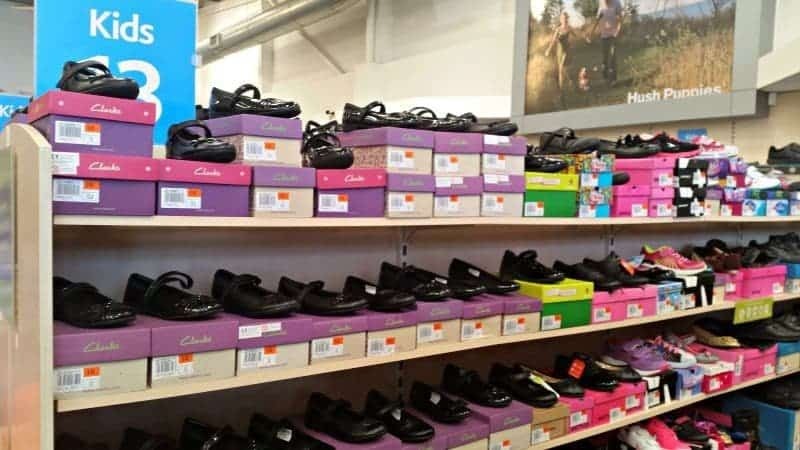 For me visiting our local Brantano store really takes the stress out of buying new shoes for children and none more so when it comes to back to school shoes shopping. Visiting the Great Yarmouth branch yesterday we were welcomed by Pam who sat Roo and Tigger down in turn to measure their feet. Ensuring that both the length and width were checked on both feet and recorded on their own special slip of paper. Roo has a wider foot measurement as well as a high bridge so we were advised styles would fit best for her and not cause her any rubbing or tightness across this areas. Heading out into the store to select school shoes with Roo and Tigger is then that Brantano shines a little brighter for me as they layout their shoes in size order so that you can see at a glance what styles are available. Gone are the meltdowns of one of the children selecting their desired style only to find that it isn’t available in their size. With Roo measuring a 12.5G there was only a few pairs of shoes available in her size, however Pam explained that we could try going up a size and down a width. With this in mind Roo managed to find a pair of Daisy Sparkle Junior shoes she liked in a 13F which Pam kindly then fitted for her. Upon walking up and down in the shoes Pam noticed that they were slipping a little at the back so suggested that an insoles may help bring her foot up at the back to stop the slipping. I must admit I’d never thought about popping an insoles into children’s shoes to help with the fit I would have simply made Roo chose another style. Adding in the insoles helped move Roo’s heel into a better position and stopped the slipping. Tigger is usually the easy one to buy for, however as he had managed to spot some rather cool looking superhero trainers on the shelves next to the school shoes it took a little persuading to get him to select a pair of black school shoes instead. Thankfully we managed to find a couple of pairs of shoes that he liked but as soon as he saw the Stomp Rex shoes his mind was made up (the fact it comes with a dinosaur footprint on the bottom it really sold it to him). Similar to Roo’s fitting his foot was slipping at the back so Pam once again added some insoles into the shoes which really helped raise his foot up and stopped the slipping. With both children fitted with shoes, Pam sat them down and explained that they should pop them on for around 30 minutes everyday to get the leather nice and soft ready for school so that they felt as comfortable as possible. She also told them that it was important to look after their schools so to give them a wipe over when the get home from school to get the dirt off them (I imagine I’ll be the one doing this but I can live in hope). Finally before we left the store the children signed up to the Brake #walktoschool campaign which Brantano is giving 10p to the Brake charity for every pledge. As both Roo and Tigger are at the same school from September we are looking to walk to school as much as possible – especially once Piglet has arrived and I’m not allowed to drive for six weeks. Have you had your children’s feet measured and fitted for new school shoes? I love that you can see which shoes are available, much better than a sales assistant going out and finding them for you. I have to admit I fit my own children’s shoes – but can see how expert advice would be a lot better and their feet are very important. I must admit I’ve never had shoes fitted for Kitty and Ozzy before. I like the sound of the layout,seeing the sizes that are available is much easier and quicker than to-ing and fro-ing to stock rooms. Nice shoe choices! When it comes to my daughter going to school I will definitely go and check out brantano. Feet are so important and for Erin especially I am so careful with what she wears as she has hip and feet problems and wears orthotics too. It is great to know that Brantano look after little peoples feet so carefully. It sounds and looks like you had a great experience….Those shoes look fantastic! I always remember going to get my feet measured as a kid and my Mum asking the lady to just bring out “whatever they had in my size” which usually meant there was very little choice.